The circle of fifths is an almost magical tool for musicians! Magical in its simplicity. Here is an ingenious invention to help you find major and minor key signatures, scales, chords and more. Before we look at the picture of the Circle of 5ths (below), you first need to know what it is made up from. First, remember that we have only 12 different pitches? The 7 white keys with the basic notes: A,B,C,D,E,F, and G.
Second, remember what a perfect fifth was? No? A perfect fifth is the interval between two notes that are exactly 3 1/2 steps or tones apart. Lets Take a "Walk" on the Piano Keyboard! Start from the lowest C on the keyboard (to the left). Play a perfect fifth up... G. Right. Continue another perfect fifth... D.
Now continue like this and you will get: C-G-D-A-E-B-F#... What?! Remember that between B and F there is a diminished fifth, only 3 steps, so we have to take F up 1/2 a step. OK? F - and...yes! We are back on C again!! 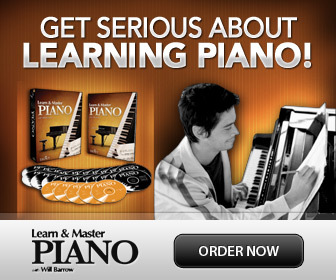 You just traveled around the piano on all the 12 different keys, all a perfect fifth apart! The clock has 12 hours. Neat! We can use the clock as a template! Start at 12 o'clock. Let's decide that C is here. Going to the right, around the clock and you will return to C again. OK. Now How on Earth is this Useful? 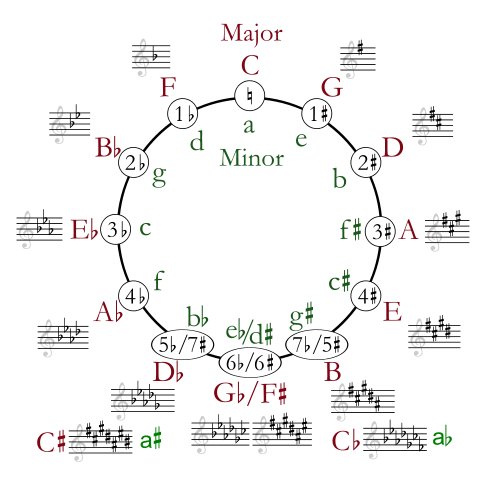 You can use the circle of fifths to get an overview over all the 12 tonalities or key signatures in major- and if you look at the inner circle also the relative minor! -Hey- wait a minute! I can't see any 8,9,10 or 11 sharps or flats? So the circle of fifths you saw above is "merged" with what could have been a circle with only sharps and a circle with only flats. One side is with sharps, and the other with flats. C is "natural" since it uses only white keys. In this way- going to the right from C until about 7 o'clock gives you 7 key signatures with sharps. And going to the left of C, again 7 "hours" backwards- gives you 7 Key signatures with flats. Cool! You can easily see what chords work well together: Pick one, let's say F major. The neighboring two, Bb and C together with F are the most important chords i F major- AND you can easily change them with their relative minor chords right underneath! So, in F major you can use: F, Bb and C major plus d, g and a minor chords for a "smooth" harmony! Go to the piano and try it out!! Plus- if you work with functional chord analysis- there are your Tonic (I) (Pick any note), Sub dominant (IV) (To the left of the one you picked), and Dominant (V) (To the right), chord functions. And finally, for all the music theory geeks like me- isn't the Circle of Fifths just beautiful? My recommendation: You can learn more about music theory with Alfred's Essentials of Music Theory, perfect for beginners. Learn Piano Scales Easily with the Circle of Fifths!